Each parcel contains a variety of basic food items that can be used to make meals for several days. We aim to include things for breakfast, lunch, dinner and snacks for children’s lunch boxes. We can usually provide basic food for dogs or cats also. A typical parcel for an average family of two adults and two children has a value of over $100. We try to stock gluten free items as these can be very expensive and more and more people seem to have this intolerance. During 2017 we provided 502 food parcels which helped over 1 500 people. At Christmas time the agencies we work closely with send us names of individuals and families they would like to have a little extra assistance over this special period. We provide Christmas parcels to these families the week before Christmas. 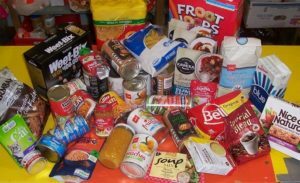 Parcels contain the normal staple food items but extra things such as mince pies, cake, lollies, chocolate, drinks, chips, puddings etc. We do not supply gifts as other agencies in the area do this. In 2017 we supplied over one hundred Christmas parcels to families and individuals in our area. Wordpress Theme Customised by Ad Blankestein.